An enchantingly illustrated, lift-the-flap version of the classic fairy tale. 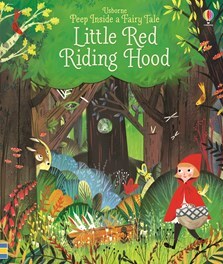 Little children can peep through intricate, laser-cut holes into the dark woods, lift the flaps to see what's beyond the trees, and keep an eye out for the Big Bad Wolf as they follow Little Red Riding Hood through the fairytale forest. The books pace-setting words are matched perfectly with charming illustrations. With every turn, more of Little Red’s near-three-dimensional world is revealed. Her red cape shines through the pages like a beacon, through the dark wood filled with rabbits, deer and squirrels. Usborne has produced something wonderful - this is a book to treasure, which is sure to entertain not only the listener but also the teller. There are lots of things to spot and talk about, making this a great addition to your child’s library. With lavish illustrations and plenty to talk about, this ingenious peep inside fairy tale book guarantees storytelling magic… and all the fun of discovery for both children and parents. With its gorgeous illustrations and fun flaps for small fingers, this is a great addition to Usborne's popular Peep Inside series.